Saturday evening festivities begin with a spectacular fireworks display, which can be viewed all through the Village of Ida. Then the Granddaddy of all light parades kicks off featuring 130-illuminated and animated parade entries that light up the entire village for nearly two hours. 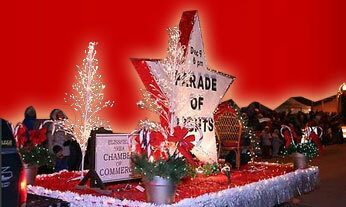 Sparkling with thousands of lights, fire trucks, floats, parade balloons, cartoon characters, bands and marching groups join farm implements in lighted displays that entertain an estimated 48,000 visitors year after year. The parade has attracted entries from Michigan, Ohio, Indiana, Wisconsin, and Canada, including national enterprises such as the Keebler Company, McDonalds Restaurants, Culligan Water Conditioning, Emergency Mr. Plumber, Detroit Edison, Dean Foods-Country Fresh Products, UPS, the Aquila & Michigan Gas Company, AM910 Radio Disney, Meijer, the Falun Dafa Parishioners, ITC Holdings Corp., and Anita's Dance Company of Wisconsin. Personalities who have participated are Jillian Harris star of the 2009 hit reality show competition show "The Bachelorette" and her fiancé Edward Swiderski, Kay Lani Rae Rafko, Miss America 1988; World Champion Boxer, Bronco McKart; Ernie, the Keebler Elf; Detroit Tiger Paws, the Grinch, Louie the Lightning Bug, Big Bird, Ronald McDonald, the National Champion Owl Creek Clydesdales, Cherie, and Radio Disney sensations JUMP 5, Everlife, Joey Page, Savvy and Mandy, New Hollow and A Cursive Memory, SAVVY-The Wannabes, and Country Music Legends LITTLE TEXAS, Restless Heart, Collin Raye, Keith Andersen, and Shelagh Brown, and Kelsie May. Indoor storage can be obtained prior to event day on a first come, first serve basis. To ease the line-up procedure, parade officials will be wearing reflective vests. Use the south Ida School drive to enter the parade line-up. For your convenience, the school will be open and food vendors will be available. Upon your return to the school parking lot after the parade, please proceed to the very east side of the parking lot to enable incoming floats to return. Parade officials will direct you through the parking lot. Because of large crowds and congested traffic, it is recommended that you car pool and remain at the school after the parade for a time to allow traffic to subside. beginning Saturday, December 14 at 7:00PM. Brought to you by D & P Communications and produced by MPACT.